So the real question should be, how specific should we be with our exercise prescription? (Now this could have turned into an epic blog, but I have decided to keep it brief and readable! )In my opinion, WE SHOULD ALWAYS BE SPECIFIC. Now that’s a pretty emphatic statement so I should probably add a bit of nuance to that. For some people, the term specific means that we should use a SPECIFIC exercise for a SPECIFIC problem. The world of therapy is littered with exercises that have been held up as the ‘best’ exercise to fix a certain issue and not achieved that status, think TvA activation exercises for back pain or VMO exercise for knee pain. Being specific in this way does not appear to be warranted with the current evidence base we have. We could also be specific to some form of physical quality like strength or range of movement. We see that in many cases when it comes to MSK pain going after a specific physical quality also does not seem to yield better results, there ARE a couple of examples of when being specific is important and I will discuss those later. I might be bold and stick my neck out and say that non-specific pain (meaning we cannot pinpoint the source), of which we seem to have a bunch of around the body, probably needs a non-specific approach to exercise. This means that we cannot strongly suggest a singular exercise or a type of exercise that focuses on a physical/biomotor quality. So Why The Need For Specificity? So, everything I have said so far may seem to point towards there being no real need to be specific. Does that mean that we can just give someone any old exercise and expect to see a positive result from it? I don’t think so. Any application of exercise should come with some form of reasoning and we should start with the end in mind. What SPECIFIC effect do we want from our exercise? This will be SPECIFIC to the person and their current issue or goal. This means that the reasoning approach is always specific but the application may not always be the same. So rather than be SPECIFIC to a type of exercise or presentation we are being SPECIFIC to the PERSON standing in front of us. There are many different outcomes that we may want to achieve from our application of exercise and we find we can influence lots of different elements of human function.To make things a bit simpler and more organised we could make some broad categories. This could be tolerance of a specific tissue such as a tendon or muscle although we still have not quite worked out the relationship between pathology and pain here. There may also be clearly defined scenarios where we see the need for specific biomotor qualities, such as strength needing to be addressed postoperatively. Pain relief maybe another specific outcome that you want to achieve from your exercise prescription. It seems there that lots of types of exercise may create analgesic effects. Isometrics are the flavour of the month at the moment, but both strength training and cardio training also have the potential to create analgesic responses. I am still slightly on the fence about the usefulness of short-term responses for all but I can see a clinical need for some groups of patients. 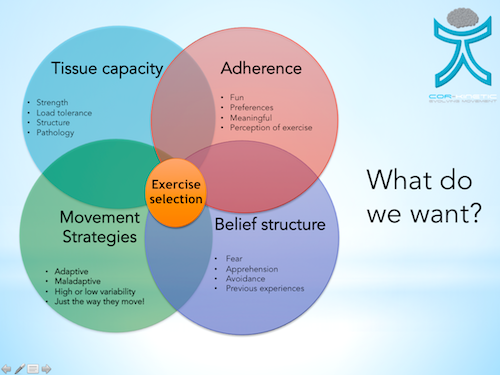 As we start to move away from a tissue focused view of exercise and movement, the concept of beliefs around exercise becomes much more important concepts such as fear avoidance and exposure-based therapies are starting to gain traction, and rightly so, especially as their role in actually getting people moving is starting to be appreciated more and more. We might have to be very SPECIFIC to a movement but that movement is probably very SPECIFIC to the individual as well. to get someone moving again. It has been hard to pin down many SPECIFIC movement ‘problems’ that we reliably see as a cause for pain. Our understanding of the mechanisms behind the pain experience are broadening and we see modern concepts such as the decoupling of SPECIFIC movements from pain responses as a plausible reason for using a movement based approach, but again these seem to be quite SPECIFIC to the individual. Variability that is either too high OR too low might be relevant to pain, maintenance of pain and injury, or not! who knows? It might be that just MOVING is what many people need! Being Specific – Where’s Your Data!? This does not mean that there are NO specifics we should aim for across people but they DO need to be clearly defined. An example here might be, return to play for ACL rehab. Better outcomes have been shown if patients achieve RTP markers of almost equal, within 10%, of quadriceps strength and also hop performance. We also see the specific use of eccentric contractions with the prevention of hamstring injuries over concentric strength work. The key here is if you ARE being specific that you have some form of data to back it up. All exercise gives individual responses, it’s not just fire and forget. Lots of exercise research is based around comparing the means of two different groups to look for a statistically significant difference or variation between the two groups. While this type of analysis does point towards a trend for an effect, in reality, it gives us little idea about individual responses to exercise so it is important to monitor someone’s response rather than just expect your reasoning process to have a successful outcome. An exercise could make someone better, worse, or simply have no difference. It is important to know that many exercise interventions don’t achieve spectacular results. The actual effect is often around the minimal clinically important difference (MCID). The MCID is the smallest difference that a patient is likely to see as important to them. Although this number varies across studies is generally around 2 points on an 11 point 0-10 VAS scale. We must always be prepared to adjust the exercise type or dosage based on the SPECIFIC response from the patient. Want to be specific? Have data!